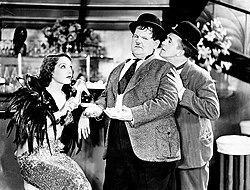 The catchphrase most used by Laurel and Hardy on film is: "Well, here's another nice mess you've gotten me into!" The phrase was earlier used by W. S. Gilbert in both The Mikado from 1885 and The Grand Duke from 1896. It was first used by Hardy in The Laurel-Hardy Murder Case in 1930. In popular culture the catchphrase is often misquoted as "Well, here's another fine mess you've gotten me into." 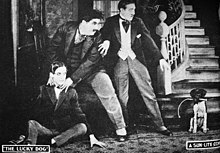 The misquoted version of the phrase was never used by Hardy and the misunderstanding stems from the title of their film Another Fine Mess. Numerous variations of the quote appeared on film. For example, in Chickens Come Home Ollie says impatiently to Stan "Well. ... " with Stan replying, "Here's another nice mess I've gotten you into." The films Thicker than Water and The Fixer-Uppers use the phrase "Well, here's another nice kettle of fish you pickled me in!" In Saps at Sea the phrase becomes "Well, here's another nice bucket of suds you've gotten me into!" 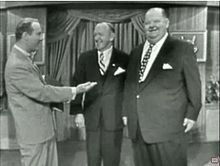 The catchphrase is used in its original form in the duo's 1951 film Atoll K, where it fittingly serves as the final line of dialogue in what is the final Laurel and Hardy film. Most times, after Hardy said that phrase, Laurel would start to cry exclaiming "Well, I couldn't help it..." and begin to whimper while speaking with none of his words being able to be understood. ^ "Samuel Beckett's funny turns". The-tls.co.uk. Retrieved January 17, 2019. 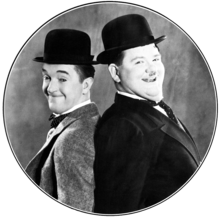 ^ "Another Nice Mess: The Laurel and Hardy Story (Audiobook) by Raymond Valinoti". Bearmanormedia.com. Retrieved January 17, 2019. ^ Rampton, James (September 1, 1998). "Arts: What a fine mess they got us in". The Independent. Retrieved January 17, 2019. ^ "Laurel Letters Sold At Auction". Laurel-and-hardy.com. Retrieved January 17, 2019. 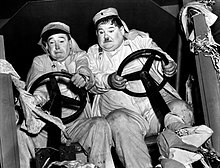 ^ "Laurel and Hardy: Two angels of our time". The Independent. January 4, 2019. Retrieved January 17, 2019. ^ "Slapstick or Lonesome No More". Penguin.co.uk. Retrieved January 17, 2019. ^ "Shop". www.laurelandhardyshop.com. Retrieved December 5, 2018.